These are usually for a desktop or table top, placed in a stand-up frame, and commonly given as gifts to parents/grandparents/etc. This size works well displayed along a hallway or staircase, because usually the width of the space puts the viewer closer to your print. This size also works well when several are grouped together to form a larger display. Usually over a couch, fireplace/mantle, in a dining room or other centerpiece viewing area. These prints or canvases are usually located in a much larger room (sometimes with two-story ceilings), and are displayed on a much larger wall, and therefore will be significantly farther away from the viewer. One other thing to consider is whether or not you plan to mat and frame your prints. There are many products (like canvases, mounted prints or prints wraps) that are considered “finished and ready to hang” and therefore do not need to be matted and framed. 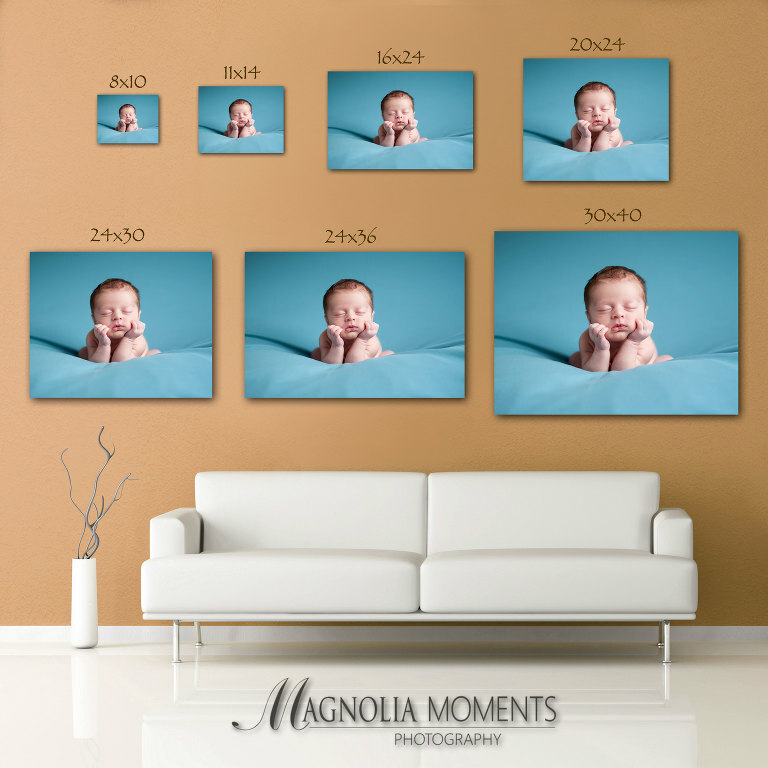 However, if you are planning to go with standard prints, remember to take into consideration the added width of the mat and frame you have selected which will increase the prints visual presence on the wall. Also, grouping several smaller prints together to form a larger display can be pleasing. To help you “envision” the relative size of several popular print sizes, I have created the comparison above where I have taken various sized prints of the same image and displayed them over a standard sized couch (in this case the couch is 82″ inches long). Seeing the prints on the wall relative to the size of the couch, it is much easier to see how some of the smaller print sizes really can’t stand alone on a large wall. Still undecided? You can also take this a step further, by taping together pieces of colored construction paper to simulate the print size you are considering (be sure to add the width of any mat and frame you will be using). Using painter’s tape, or something similar that won’t damage your wall/paint, put the construction paper shape on your wall where your print will eventually hang. Stand back and see what you think. Repeat the process with a different sized construction paper shape if necessary. Once you think you have it right, leave it on the wall for a day or so until you are comfortable you have the look you are going for. I hope this helps! If you have other questions, please check out our Fequently Asked Questions or Contact Me!